We get a lot of questions about migration. Do the Decorah eagles migrate? Do our Peregrine falcons migrate? Where do they go when they leave? We fitted two young eagles with tracking devices in part to help answer some of these questions. I used to think migration was very simple. Like a lot of people, I thought that all birds except chickadees, pigeons, crows, and woodpeckers migrated once it got cold. They went south to escape snow and ice, returning to nest when the weather warmed up. 'South' was anywhere it didn't snow, or at least didn't snow much: Georgia, the Gulf Coast, South America. I had no idea that many birds don't migrate, or that 'south' could be Minnesota or Wisconsin. Peregrines and Bald eagles taught me otherwise. Bald eagles and Peregrine falcons are partial migrators - that is, some members of the species migrate and others do not. Mom and Dad Decorah both stay put on their territory year round. They have abundant food and water, so there is no reason to leave. Belinda, the falcon at the Xcel Allen S. King plant in Stillwater, Minnesota, also has a history of staying put. There is abundant food on territory and an open water supply slightly south of the plant. In both cases, the resident bird or birds' presence may make it easier for them to preserve their territory without having to chase off interlopers that set up house in their absence. However, other birds, even those with defined nesting territories, leave. Immature and adult Bald eagles congregate in large numbers by open water along the Mississippi river, a very important flyway for many kinds of birds here in the midwest. Belinda may stay put but it is not uncommon to see interloping falcons at empty nestboxes: just two weeks ago, Brenda Geisler spotted a Peregrine falcon from North Dakota at the Great River Energy nestbox in Elk River, Minnesota. What is migration and why do some birds stay put while others leave? Among birds, migration is the regular, endogenously controlled, seasonal movement of birds between breeding and non-breeding areas (Salewski and Bruderer 2007). Bald eagles and Peregrine falcons are partial migrators - that is, some members of the species migrate and others don't. This is the most common type of migration, which makes sense since migration is driven by a number of factors, including daylight length, food availability, weather, the time it takes to raise young, and the distance between wintering and breeding grounds. Migration allows exploitation of different habitats as environments change seasonally or successionally (Dingle, 1996). Food availability seems to play a very important role in the migration of Bald eagles: inland northern Bald eagles tend to move southward after ice and snow start putting a lid over their favorite food source - fish, while southern Bald eagles are thought to move northward once warm weather drives fish into deeper water (there is some debate about this). Weather can also impact migration timing in other ways: for example, a favorable wind pattern might help compel a bird to leave for its wintering or summering grounds if other factors are in place. 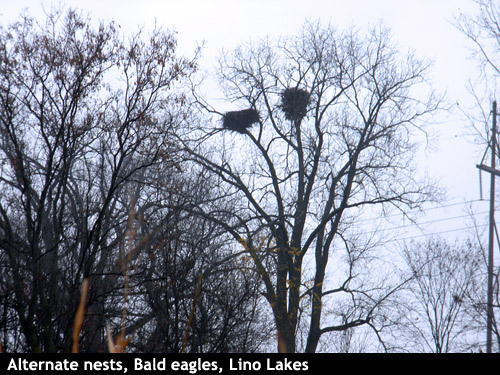 In general, young Bald eagles are much more nomadic than adult Bald eagles, something we've seen with both D1 and D14. In spring and summer, hatch-year and young sub-adult eagles may fly north to over-summering areas in the northern United States and southern Canada, returning to their birthplace in late summer or early autumn. Or they may not, as we've seen with D14. We don't know why D1 dispersed so much farther than D14 in her first year. Among Peregrine falcons, females tend to disperse farther than males* , but I haven't been able to find documentation of gender-related dispersal in Bald eagles. I'll keep looking, and you are welcome to post links and resources in the comments. Perhaps further study will shed some light on the issue. Eagle migration and dispersal is very complex. 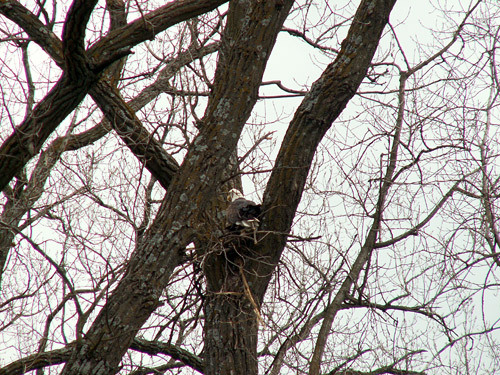 What do Bald eagles and Peregrines do? It seems they most likely use multiple sources of information, including celestial and magnetic clues, light polarization, wind patterns and direction, and geographic cues (which would likely be highly correlated with geography). Although parents and young don't migrate together, D1 and D14 were in the company of other eagles every time we saw them, so I suspect that some degree of learning, or at least following, also plays a role. Again, we really have no idea why D1 and D14 behaved so differently. We suspect that D1 will come back to NE Iowa this winter, following Lake Superior's western shore. We don't know whether she will come down along the Mississippi river or go back into western Wisconsin, where she spent so much time in the fall of 2011. But we are looking forward to finding out!